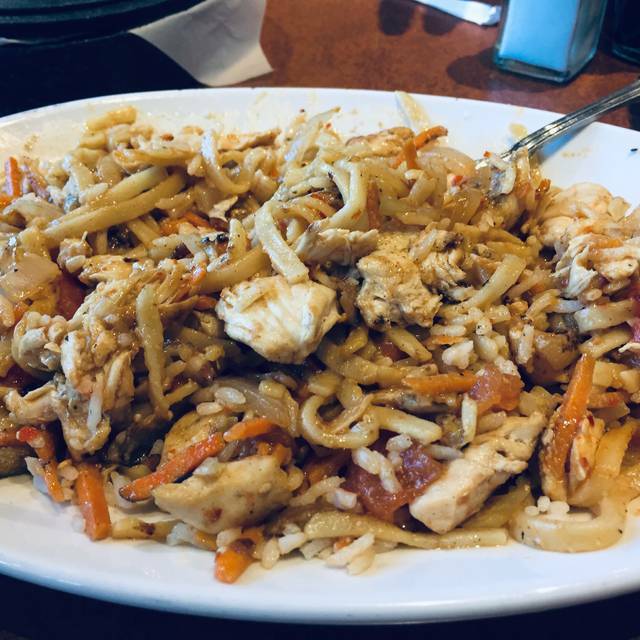 You must make reservations at least 5 minutes in advance of the time at bd's Mongolian Grill - Novi. Great time with the family for my sisters 27th birthday! Great food and great service, despite it being very busy. I like the fact that you can pick your own stuff to put in the bowl. The guy on the grill was enjoying his job and making sure you enjoyed your experience. I would have liked a few more items on the salad bar, but all in all, good food for a good price. This place is always good. There really isn't anything bad to say. Great experience as usual. I made a reservation because we had plans for the evening, and I didn't want to get stuck waiting for a table. We were in and out in the expected amount of time (an hour) and had a great meal. We come here every now and then but last nights service with Brandon was the best! He was so personable and on top of things! Made our valentines dinner perfect! Was fantastic. I was my daughters birthday and they made it a good one! Wow. What happened to this place?? Only one guy on the grill trying WAY to hard to be funny while people were waiting too long for their stuff to get grilled considering how empty the place was. The area where you pick out your ingredients was sloppy and no plain chicken. Really? How can you be out of things when the restaurant is only 25% capacity? The salad bar was DISGUSTING. I'd already ordered it and I'm pretty sure our servers brain would have fried if I asked him to take it off so I ended up with a plate full of cottage cheese instead. Just what I wanted, a $5 plate of cottage cheese. I used to meet my extended family members here every year the day after Christmas for lunch. We all walked away knowing we'd have to come up with someplace new for next year. The service was awful, we had a party of eight and ordered appetizers and only 4 plates and 4 forks were delivered for us. We asked for more and they never came. We had to share plates and forks to eat appetizers. When we ordered dessert it took 45 mins to come out and the place was NOT busy at all. Plus, how busy is a waiter at a buffet style restaurant. Will never go back again. Great food options. Great service always. My 2 brothers both had the bowl and got ill from the food. My husband and had the soup and salad bar and that was OK. The bathrooms were in poor condition and in need of cleaning and repair. The only positive was the very friendly and efficient server Miguel . He was awesome. We drove from Lansing to celebrate my brothers birthday, and I wish we had gone to Red Lobster which was our first choice. The cooks were very high energy the entire time and were singing and really enjoying their job. There was lots of interaction with the customers who were waiting for their meals. Great service, Excellent food. I highly recommend the Novi location. Also, we have one person who is Gluten free in our family so we love to come here for her. They have several gluten free options including sauces. Thank you! Bartender on duty was also a great waitress- thanks!! Waitress was absolutely amazing, very attentive and curtious and my absolute pleasure to have dinner with my family and friends for my daughter birthday dinner. My friends and I really enjoyed eating there! Thank you! Our table was a tight fit. Just not comfortable seating spot, in a corner and close to another table, it was hard to get in and out of seat. And we seated right outside waitstaff area, so a lot of activity. The restaurant seemed quite noisy, especially the grill tongs clanging all the time. Food was over cooked. I had chicken in mine, and I had a lot of tiny bone pieces and cartilege. I had to be careful,and kept spitting pieces out. Also, it would have been nice to have suggested combinations of protein and seasonings...like what complimented the chicken or shrimp or beef. Our waiter was good, very attentative. To me, the overall restaurant felt dirty. Tables felt grimy....and my pet peeve, the menus were dirty. Love going to this location. The staff is always friendly and the food is always good and fresh. I made a reservation for 16 people at 5pm for Saturday Sept 15th. I requested a private room if available. When seated, the first issue was that the "private room" was currently in use for a baby shower that would be "ending soon". The baby shower went on throughout our entire dinner party. We were squished against a wall. Any time anyone in my party needed to get up (which was frequent) all of our guests had to get up an move to let someone by. The other party was extremely loud making it so that we could not hear one another nor take pictures of our event. Additionally, my son whom is handicapped could not use the ramp. Tables were pushed so close together, it made it impossible for his walker to navigate in between. As a result, we had to get his food for him and he was left out of the BD Mongolian experience. Another disappointment was the food bar. It was not filled nor clean. I went to the hostess stand and notified someone. At that time, someone did come to refresh some of the product but not all. The server (Tori) did a great job. She was prompt, and kept our sides and refreshments full. Overall, this was a very disappointing experience and I wish I would have booked my son's 16th birthday party elsewhere. We reserved a table for 12. Preparations had been done prior to our arrival and it was nice to be seated right away. Our server was Kellie and she was fabulous! Attentive without interruption, quick to return, funny and she helped make our special occasion a night of positive energy. The guys at the grill were fun. One of them was new and the way that the lead on the grill encouraged him was great to see. They did a great job at fulfilling our request of embarrassing the birthday boy. Our experience was fantastic and I appreciate everyone that was working that night! Our server seemed surprised by each step of the dining process, the restaurant was not clean, much of the meat and veggies were frozen and difficult to add to our bowls, and the time at the grill seemed almost twice as long as we remembered. High energy and noisy. Often had to shout to be heard by others in my party. Food was delicious. Guy who ran the pit was irritated when I asked him for special prep for my 1 year old. Al I asked was that the egg was cooked separately. We were sitted in a back room that was full of small children and with all the hard surfaces it was just so much echo you couldn't hear the person next to you. Awesome time! Since the nearest one to us shutdown unexpectedly this was the closest one to us and I couldn't have been happier. Server was nice and didn't forget a thing. Food options were refilled and fresh. Will be back for sure! We tend to go here because my kids really like it. You can make your meal as vegetarian as you would like or load up on meat! Celebrated two birthdays the night we were there. Fun. The food is not elegant, but the atmosphere is enjoyable. The food is as good as you make it. Service is actually pretty good though. The food you pick out to get cooked is in a buffet setting. The buffet was quite overrun. There was food all over, vegetables in sauces, sauce all over the buffet and honestly the temp on the uncooked meats looked a bit spotty. They are supposed to be chilled.. looked more room temp. There weren’t enough of anything, no sauce bowls, no soup bowls, no onions, etc, etc. The only thing I could give them was that it was Mother’s Day weekend but I saw enough staff there and the place was NOT overrun. Made reservations a week in advance during an off time. Table we were sat at had food on the floor and used silverware on the floor under our table. Menus were dirty and looked like they should’ve been replaced months ago. Overall dirty. The food as always was good but the hostess did not know what Open Table was and thus we received no Open Table credit. In fact, I received an e-,mail from Open Table that IO had not honored my reservation. If I didn’t like the food, it would be my fault for picking a wrong choice in my bowl! Food and service was good, but so noisy we had to shout at each other, couldn’t hear a thing. Should have kids birthday parties in room w door on it. Was very unhappy, won’t go back to Novi location. Restaurant was Extremely noisy, couldn't even talk to each other. Finally moved to front of restaurant, which helped a little. Food, Service, etc. was wonderful but loud patrons kind of ruined it. So much has changed since my family and I were here last. The actual meat selection wasn’t great at all. Steak was just beef- but very chewy and a lot of it was brown. It had that weird smell to it. The sauce selection wasn’t great. We kept adding fresh garlic (which didn’t have much flavor at all) and a lot of seasoning to get actual taste from the food. I felt like the garlic and seasonings were just so bland. It was very strange. In all honesty, I added 7 scoops of garlic before I could actually get a taste. The grill people were amazing with my kids and made them laugh which made it a bearable visit. It was a young group of males and they tried very hard to sings songs my little kids could relate to and that was nice. But, because if the meat selections we won’t be going back anytime soon. We love to go to BD's, the staff is always friendly and the ingredients are fresh!